The place for Women, Girls, and Infants! Where to get modest clothing? That is a question that many people are asking today, and before Phyllis Jean's personal experience has shown that there was little to say. 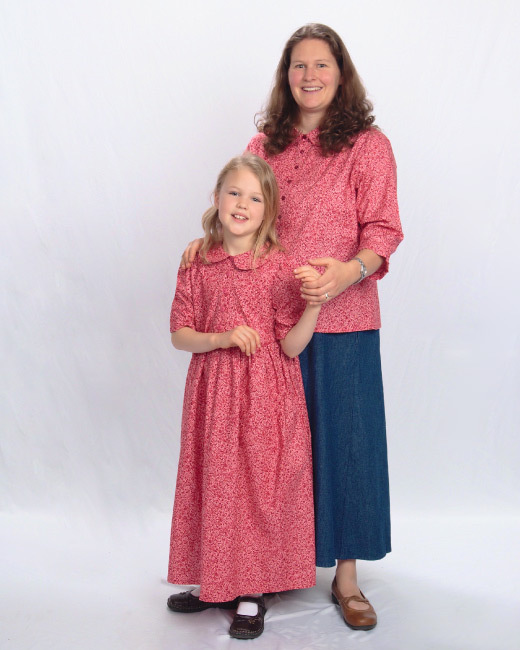 Whether you are a mom, teen, toddler, or grandmother your choices of modest clothes seem to be slim to none. Everything we have found was, "oh well this might work if you just sew up this slit, or round that collar (so as not to look like a man's shirt), or if you only added sleeves, or pinned the opening at the top of the blouse..."
I'm sure you've run into all these situations and many more while shopping. Not to mention the trouble and time it takes to go out to the malls, only to come back tired (of the music!) and frustrated, and left with the same options you had before you left. 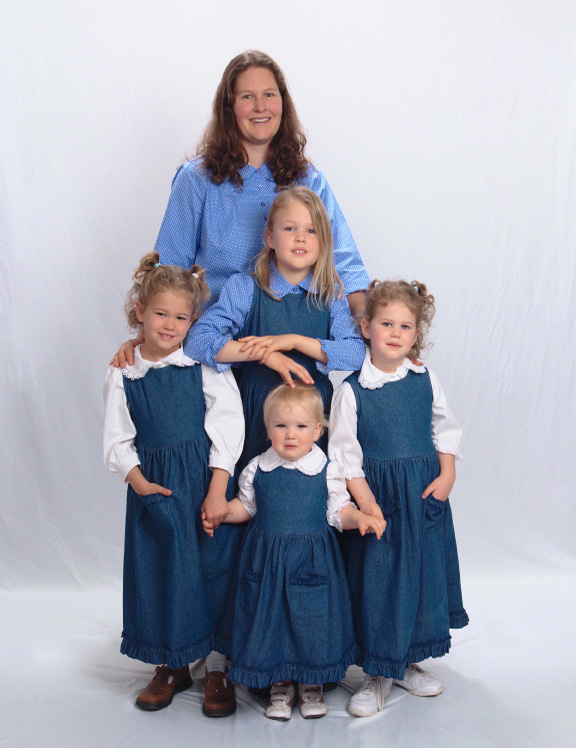 "I have found a company with beautiful modest clothing for women and girls-Phyllis Jean. I was sent a gorgeous 10 Gore Denim Skirt..., and it has become my favorite skirt!" After countless frustrating efforts to find modest feminine clothing of good quality in all the usual retail outlets we finally made the decision to manufacture our own. This decision involved design classes, pattern searches, seemingly endless cutting and more cutting and in-depth research into sources of quality fabrics and top quality seamstresses. We believe you will be the beneficiaries of our decision and we are confident that you will find just what you are looking for in our inventory of modest feminine clothing in a variety of good quality products at competitive prices! Enjoy our site and we hope everything you are looking for is just a click away. Young Ladies Dress in Pink Petals, Ladies Blouse in Pink Petals and Ladies Denim Skirt shown above. "Phyllis Jean is the only place on the web to get truly modest clothing that is also truly beautiful! May God bless you for the work you do." Choose from a wide variety of colors and natural fiber fabrics. From the claret Tencel skirt for dressier occasions; to your everyday, go everywhere, denim skirt. Well, they're cotton, they're comfortable and they're pretty! We know you'll love these ladies modest blouses. They come in a variety of prints and colors for you to choose from. Some have a ruffle at the end of the 3/4 length sleeve and others have a lace trimmed cuff! 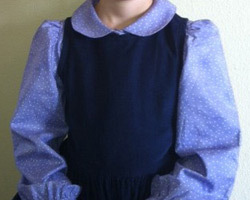 With a wide variety of girls blouses to choose from your little girl will be delighted! All are made with comfortable, breathable cotton. 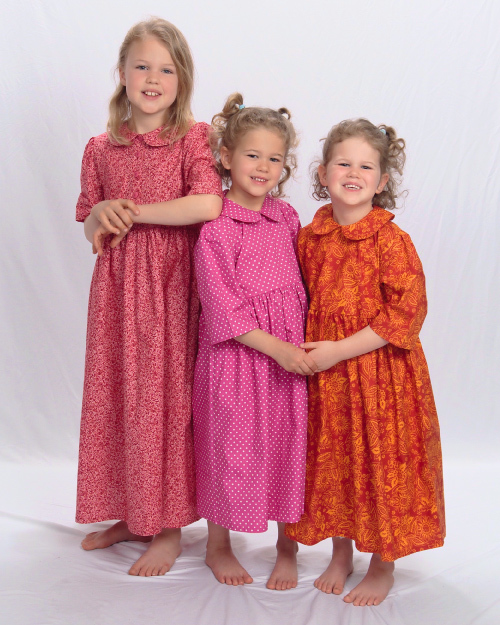 The long jumper dress is also available in soft washed medium weight denim and three corduroy colors which will be perfect for adding versatility to your daughter's wardrobe. Below is our new Newsletter (e-zine) sign-up. Be sure to sign up to get all the latest updates about our website and the goings on here at Phyllis Jean. To go to our blog click here. I promise to use it only to send you Phyllis Jean Newsletter. 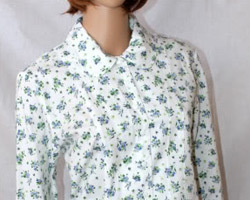 "I love the blouses that I have bought at Phyllis Jean! 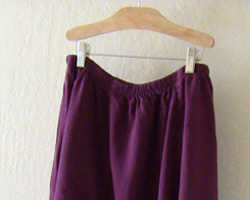 This is a great place to shop for skirts for taller girls and ladies, too." "I'm alway looking for buitful modest closting and this sight has it! "